Last Friday I had my first official Amharic lesson with an Amharic teacher. I first met Lulit Bezuayehu last summer when Anemo attended an Ethiopian "camp" in the East Bay near Tilden Park. The camp ran for one week of mornings in July and catered to children adopted from Ethiopia. Anemo did not learn much language in that short time, but the exposure to Amharic and Ethiopian culture was invaluable. 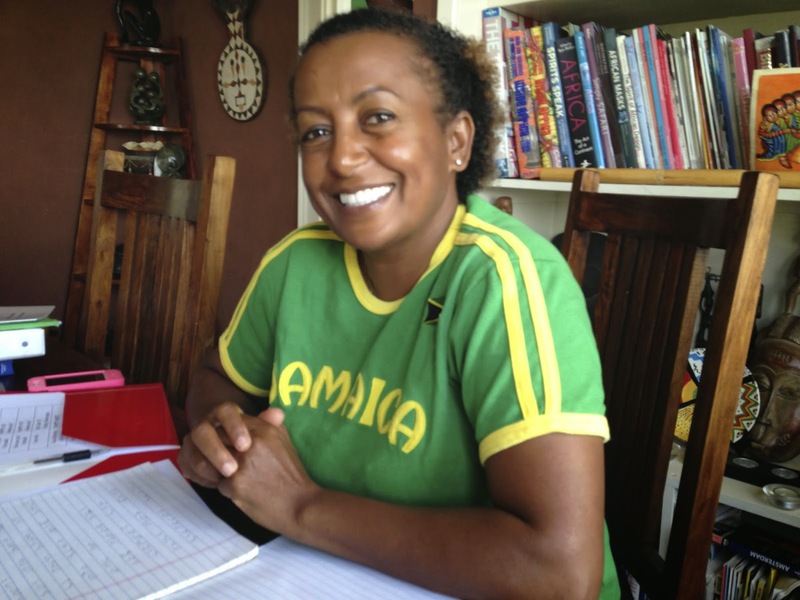 Lulit chooses a different theme for her camp each year, and last summer she focused on Ethiopian athletes, having each kid research the career of one Ethiopian runner. Anemo was assigned Miruts Yifter, affectionately known as "Yifter the Shifter" for his ability to shift into a higher gear near the end of a race. One of the notable facts that Anemo included in his presentation to the group was that Yifter landed in prison when he returned home with a bronze medal from the 1972 Summer Olympics (10,000 m). Apparently the Ethiopian government thought he had betrayed his country by deliberately skipping the 5,000 meter event, though the story goes that his trainers simply forgot to fetch him in time. Yifter continued to train in prison and eventually won gold in both events eight years later. 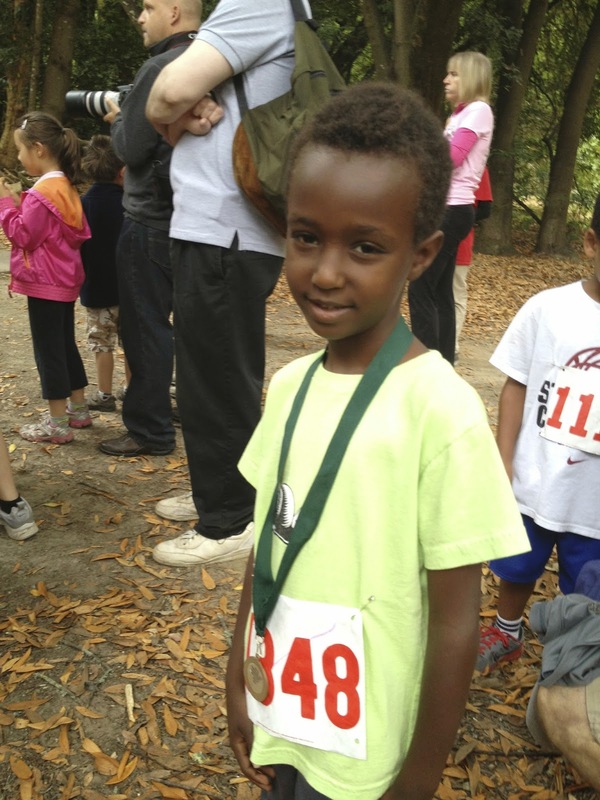 Inspired by Yifter, Anemo competed in his first one-mile race in August, where he won the bronze medal for his age group. 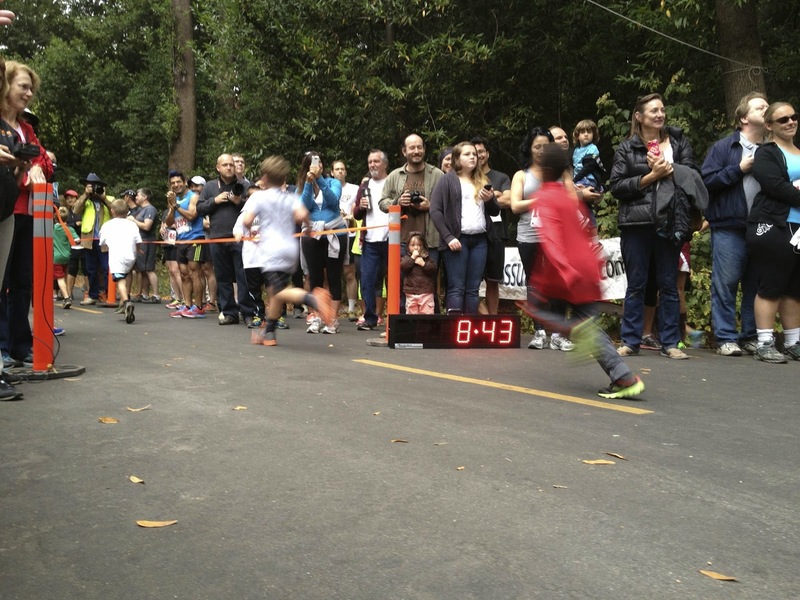 Anemo approaching the finish line at the "Race Thru the Redwoods" in Felton, CA. He shaved more than three minutes off the practice run he completed the previous evening. Anemo with bronze medal, feeling like Yifter the Shifter. But I digress. I contacted Lulit again when I decided to undertake this project, and she agreed to work with me one-on-one in her Oakland home. We began with greetings and she gave me some exercises with the Amharic alphabet. But most importantly, she translated my elevator speech thoughtfully into Amharic, writing out a polished copy from which other Amharic speakers could read. 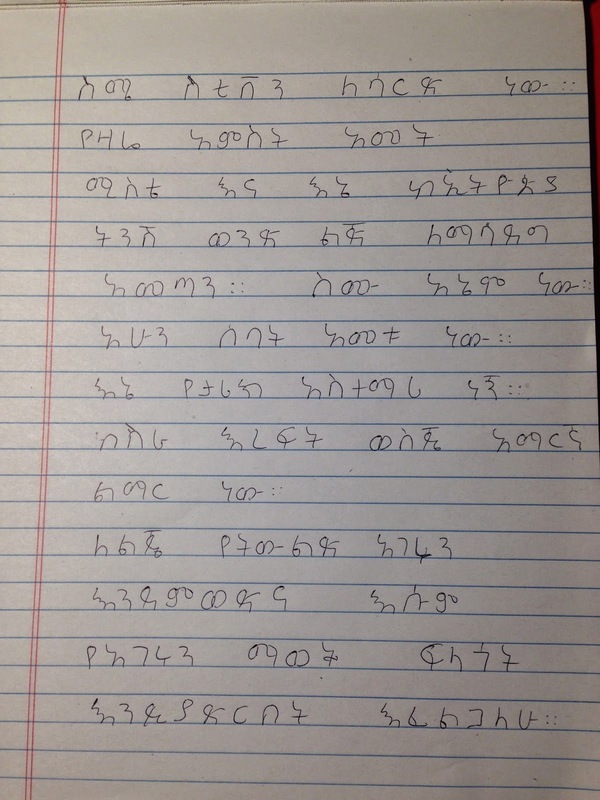 Lulit's final version of my elevator speech, explaining who I am and why I am learning Amharic. After practicing for several hours, I recorded myself using Photo Booth. This was earlier today, or actually yesterday morning, since it's now after midnight.